Sara Sherman’s 2015 TEDx presentation highlighted how equine-based counseling and coaching can change lives. We caught up with her to learn more about the Equine Gestalt Coaching Method. 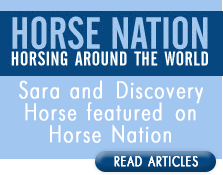 We’re continuing our feature interview with Sara Sherman, an equine assisted coach through the Equine Gestalt Coaching Method. Today, we’re exploring more of the day-to-day activities in Sara’s career.